I’m from up north where we do large portions, so I was a little wary of Reynolds, which describes itself as a small-portion cafe with a grazing menu. I like to graze and pick, but I’m also aware that many places use this to charge more for less. Which way would Reynolds go? 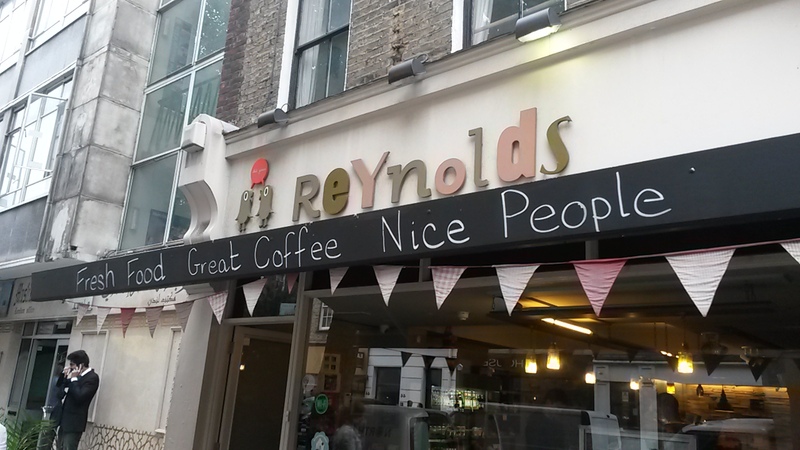 With a tag line of ‘Great coffee, fresh food, nice people’ they had a lot to live up to. Fresh Food, Great coffee, nice people? Despite going to the effort to serve Union Hand Roasted coffee (one of my favourite London roasters), they’ve decided to serve it in the Italian-style. Or, they haven’t trained up their baristas yet. Either way, the coffee has a loose foam and watery texture instead of the creamy, deep flavours I’ve come to expect from Union. It’s just a matter of fine tuning, as temperature was right as was portion size and price (£2.85). Reynolds has a really nice atmosphere and they live up to the ‘nice people’ part of their slogan. It’s a big area out the back with mix and match tables and chairs, a subtle grey/green paint scheme and walls decorated in various textures from old pieces of food crates to pages from Campaign magazine. They’ve also got a few seats out front. Nicely done. While the portions were small, they weren’t too small. For lunch you could manage with two items and come away pretty happy. I went for the chicken wrap and tart. While they were good (and yes, fresh), they weren’t great. They had the feel of a good chain not a good artisan cafe. 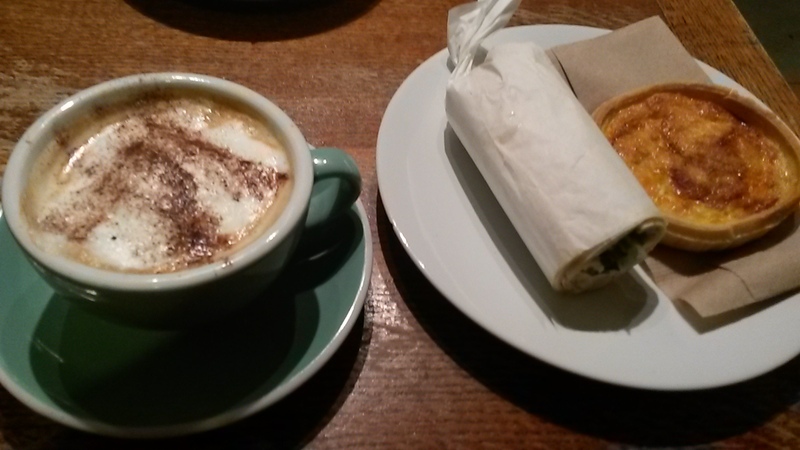 Price wise, it was just under £2 for the wrap (half a wrap really) and around £3 for the tart, so all-in-all good value. Friendly and attentive. Although they mixed up my order they quickly changed it without fuss. Score on the ‘nice people’. Free wifi (which I struggled to connect to) and water were pretty much all that was on offer. 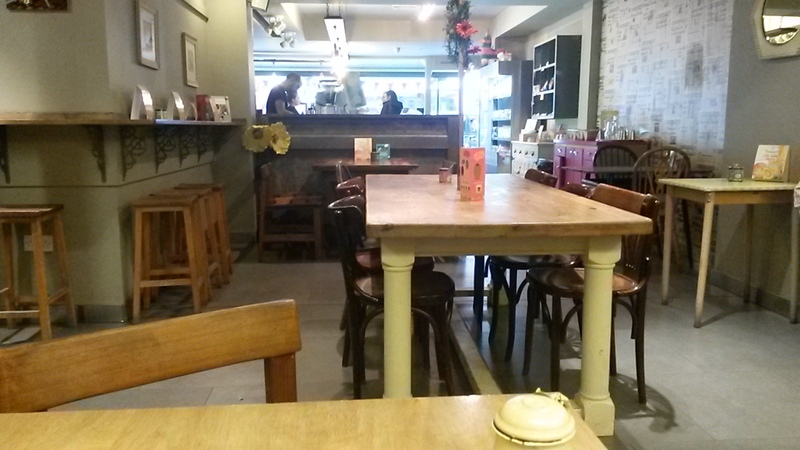 A great place for lunch – you can pick and choose and mix up your choices without worrying about breaking the bank. The decor is cool and quirky without being overbearing. A few barista lessons and this place would be top notch.